RIM has announced the BlackBerry 7.1 OS update – bringing a wide range of software improvements for phones using its operating system, including BlackBerry Tag NFC sharing and the arrival of mobile Wi-Fi hotspots. RIM has been through a tough few months, and will be hoping that 2012 can take it in a better direction, with its latest updates bringing some key functionality to its flagship phones. "BlackBerry 7 delivered a next-generation platform for our customers around the world and the range of software updates announced today build upon the strengths of that platform to further enhance the mobile experience and make life easier, from managing daily tasks to planning big adventures," said Mike Lazaridis, President and Co-CEO at RIM. BlackBerry Tag allows people with NFC enabled phones to swap information and documents by simply tapping their handsets together. 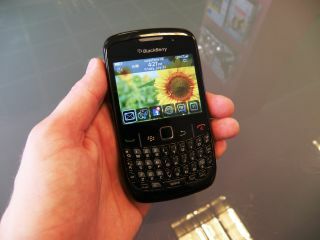 It can also allow them to pair phones or invite a friend to BBM. BBM is not just getting the Tag tech either – the update will allow a more personalised experience which includes animated avatars and new colours for chat bubbles (woo?). Less colourful, but more useful, BlackBerry 7.1 offers Wi-Fi hotspots for up to five devices – and support for Wi-Fi calling services to save on those precious minutes. Also in the update are changes to BlackBerry Traffic, BlackBerry Travel and a significant overhaul of the Universal Search functionality. Last but not least: "Customers with a BlackBerry Curve 9360 or 9380 smartphone will find a nice surprise with the BlackBerry 7.1 OS update in the form of an FM radio," confirms RIM's release. "The FM radio circuitry is already built in to the Curve 9360 and 9380 models and BlackBerry 7.1 provides users with a new app that allows them to tune in and enjoy local FM radio stations. "Listening to the FM radio does not require a data plan or use data services." BlackBerry 7.1 will begin rolling out from carriers around the world beginning today with new releases of BBM, BlackBerry Traffic and BlackBerry Travel available on BlackBerry App World as well.